After thinking about this mermaid necklace for months, and re-arranging the elements dozens of times, I have finally finished the design. My newest mermaid necklace is dripping with white freshwater pearls. A tiny mermaid lies sleeping in a shell and surrounded by an elaborate collection of sea life. 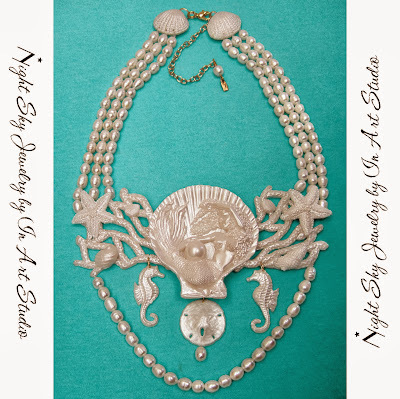 With white pearl corals and starfish, and sea horses and sea shells, my mermaid necklace is highly detailed and 3-dimensional. I sculpted and hand cast all the pieces in glowing white pearl resin and then assembled them to 3 strands of gorgeous freshwater pearls. A extraordinary new mermaid necklace design, from my Iridescent Sea Series. Imagine how romantic this mermaid necklace would look on a bride. Stunning!